Originally for Mother's Day I'd hoped to go on a family hike. That is, until I saw it was supposed to rain all morning. 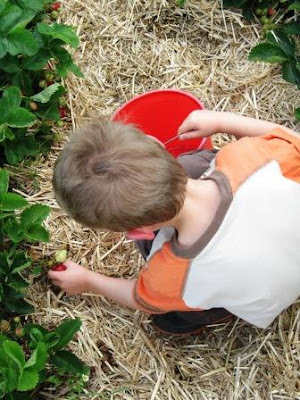 So then my plans changed to take Pierce to the strawberry patch while Paul stayed at home with the twins during their afternoon nap (the rain was supposed to stop for the afternoon). This worked out well until the car broke down on the way to the strawberry patch. 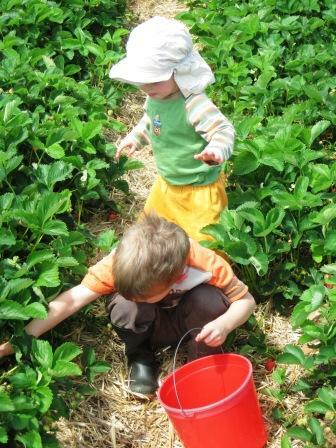 So then Paul and the twins had to come get us, and we decided to just forget the nap (not for the faint-hearted) and all go to the strawberry patch. I'm glad we did! About 30 seconds after I started picking I yelped, after sighting a small black and brown striped snake wiggling just under my picking hand. I was more careful about my picking after that! The twins actually loved the patch. Even though they kept eating white berries, instead of red. The berries were divine. So much more tender, juicy, and flavorful than what you get at the store. The kids did more eating than picking. Paul and I had to pick up the slack, or else we would've gone home empty-handed! We got home and washed the berries. Then I froze some, and we started some in the dehydrator. We also plan to make some jam, and a strawberry cake. The strawberries are so wonderful that we're already making plans for another trip to the patch! 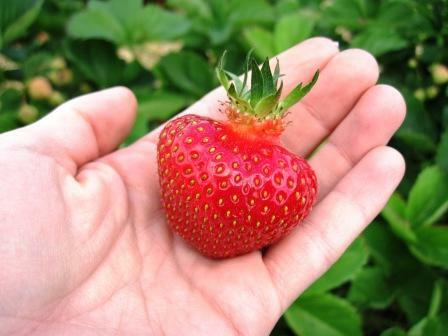 They look wonderful - I have to say my mouth watered when the first big, red, juicy strawberry appeared on my screen! Enjoy! What a great (and yummy) outing! 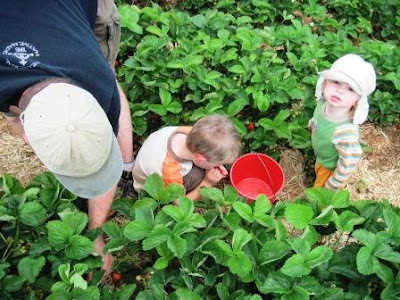 These are fantastic photos of professional strawberry (picker, eaters).The empty buckett's indicate a hole in the buckett LOL. We did the same thing last weekend. Dehydrating is a great idea! Did they weigh the boys before and after the berry picking and charge you for how much they ate? I love the boys hats! Sorry about the car! The berries look wonderful. What a great family outing! 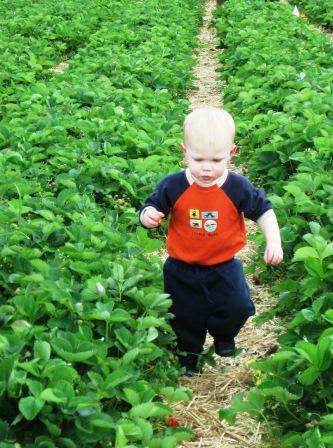 the twins are so cute, running along those rows! cuteness! How much fun was that? Sounds like the kids had a great time and mom too!!! Looks like you all had a wonderful time. You are really making me crave strawberries lately. Although, I have to buy mine at the grocery store. Still waiting on berries to ripen here..
How fun!! I think I'm gonna look and see if there's one around here, my daughter would LOVE that! (Minus the snakes of course) Glad you all had such a great day! Yum! Love the pics. Sorry about your car but glad the twins got to come berry picking, too. How fun. :) And SO yum. Interested in the dehydrated ones, how did they turn out? What do you use those for? Our strawberries are not ready yet (I called!!) but oh! I look forward to doing this! In Switzerland... double cream from Gruyère tops Strawberries like nothing else. It is sinfully (and I do mean SINFULLY) good. The spoon just stands up straight in the cream as if it were butter. Yum! Here in Sweden have the strawberries just started to bloom. A lovely preview of what's to come sometime in JUNE for us! Looks like it was a fun day for all of you. Oh YUM! We went last week, but we could only fill these super small containers. I was so disappointed. We need to go back where we went last year. 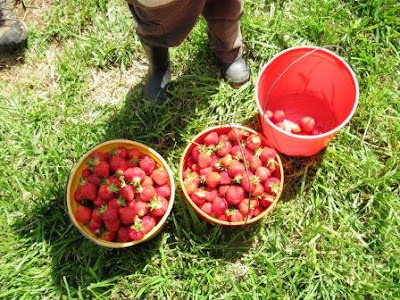 I love strawberry picking time! We have a strawberry patch nearby and I REALLY need to take my kiddos to visit soon! OH how fun!! I laughed at your comment about skipping the afternoon nap. We did that on Mother's day and paid that night. The baby was completely overtired and don't even get me started on the three year old! I love the pictures and am so glad I could go along with you! When I saw that snake, I would have been outa there!! You are a braver person than I am! Do you think the boys would have been scared of it or wanted to investigate it? 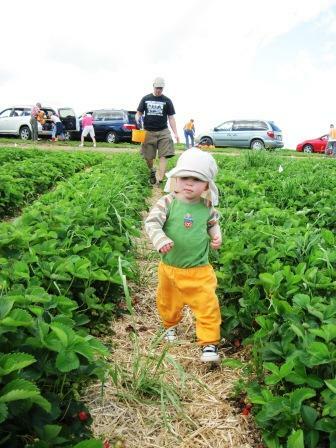 My granddaughter goes to a strawberry patch and a blackberry patch every year. What happened to your car and is it fixed yet? 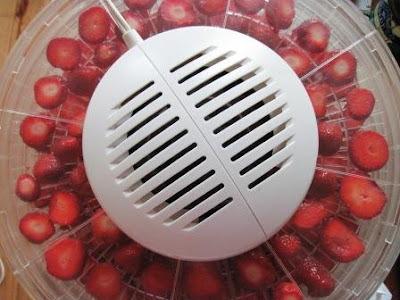 Tasty plans for those strawberries. No naps, but they had a great day. Is it strawberry picking time! Yahoo! 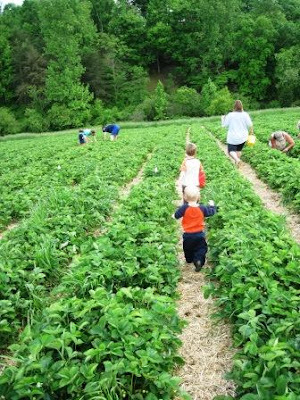 Must get the kiddos out to a farm. i LOVE strawberries! Thanks for stopping by - following back! Great pictures! YUM!!! I can't wait till they are ready around here. Mmm, now I am craving some strawberry shortcake! 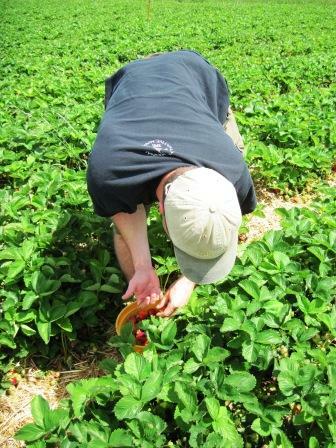 I can't believe how different your strawberry fields look from ours. I would have never thought that. Was the 15 pounds of berries in the buckets or in the kids? Sounds like a wonderful way to spend Mother's Day!! And yummy too!! 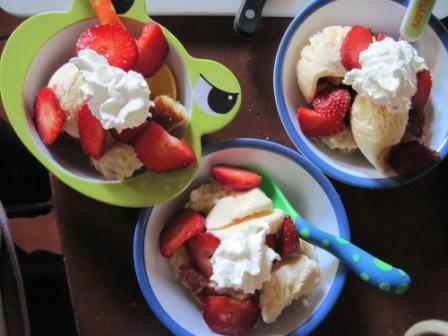 That looked like so much fun - you do so many great things with the kids - and the strawberry short cake looked pretty good too!